Madden NFL 13 on Wii delivers the ultimate NFL experience. Whether teaming up with friends in Road to the Super Bowl, challenging your rivals in Madden Showdown, or building the ultimate NFL dynasty in Franchise mode, nothinggets you closer to Sunday than Madden NFL 13. Hear all-new commentary from CBS Sports commentators Jim Nantz and Phil Simms, become a Game Changer in5 vs. 5, and collect all-new awards and special achievements along the way. * Ultimate Social Experience – Whether you’re teaming upwith your friends in the Road to the Super Bowl or crowning a king of the couch in four-player Madden Showdown, Madden NFL 13 on Wii is the best way to experience the NFL with your friends! * Game Changer – An all-new Game Changer System makes 5 vs. 5 mode more engaging and strategic. Earn pointsfor making impact plays, then purchase Game Changers to give your team an advantage. Having a hard time breaking off a long run? Activate Wrapping Sidelines and gain the ability to go out of bounds and come back in from the other side. * All-New Commentary – Every game has the feel of a nationally televised broadcast with CBS Sports commentatorsJim Nantz and Phil Simms calling the action. 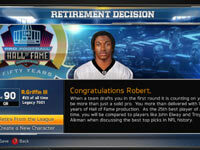 * Enhanced Franchise Mode – Build your franchise from the ground up by assembling your roster through a fantasy draft. Hire and fire coordinators and assistants, auction for free agents in a live bidding mini-game, and test your negotiation skills in an attempt to sign players to build the league’s next dynasty. 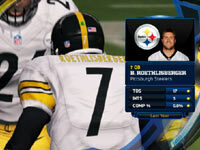 * All-New Awards – From gameplay achievements to social and franchise milestones, 75 awards have been added to the mix making Madden NFL13 as exciting as ever. Lay the Wood’ by delivering five big hits in a game or win the conference championship with your Franchise and become Super Bowl Bound. 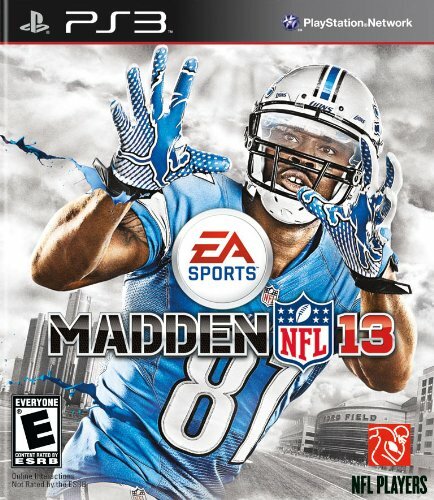 Madden NFL 13 is the 2012 release in Electronic Arts’ celebrated American football video game release. Developed around the powerful, all-new Infinity game engine, Madden NFL 13 delivers a more engrossing, complete and realistic gridiron experience than any game before it. 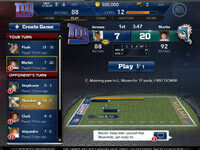 Key game features include: graphical presentation reminiscent of national television broadcasts, gameplay improvements such as a new pass-ready system, improved play action, and the all-new read and react defensive AI system, Madden social/play functionality, multiplayer support online and offline, and the ability to build the ultimate franchise as a coach, an NFL superstar, or yourself. With a completely redesigned passing game, including a new pass-ready system, improved play action, and the all-new read and react defensive AI system that features the most intelligent pass defense to date, Madden NFL 13 achieves greater realism on the virtual gridiron on both sides of the ball. In addition, Madden NFL 13 delivers physics you can feel. Powered by the all-new Infinity game engine, true player impact and authentic momentum transfer ensure that no two plays ever look or feel the same. Tackle the most intelligent pass defense in a Madden game to date. The all-new Infinity game engine provides physic that you can feel. Multiplayer support both online and in local play allows you to always share the game with friends. Live the NFL dream – whenever you want, wherever you want in a fully interactive, social, and connected online experience. Create your personal legacy or relive that of an all-time legend’s as you build the ultimate franchise as a coach, an NFL superstar, or yourself. Manage your team from your console, the web, or mobile phone in a 24/7 world as NFL insiders and experts analyze, praise, and criticize every move along the way. Madden NFL 13 Ultimate Team is the definitive way to experience virtual card collecting with new content and updates that mirror exciting NFL events throughout the entire year. Stay connected and broadcast your football glory to all your friends with seamless Facebook and Twitter integration, including easy post-game status updates and Tweets. Enjoy the drama of every aspect of NFL play with friends through multiplayer support, both online and offline. The PlayStation version of Madden NFL 13 supports 1-4 players locally, and 2-6 players online at PlayStation Network. Madden NFL 13 delivers a superb audio experience that faithfully replicates NFL Sundays with CBS Sports’ Jim Nantz and Phil Simms calling the action, QB cadences, authentic sound effects and actual on-field player chatter, all provided by NFL Films, and a fully-scored orchestral theme that conveys the emotion and excitement of professional football. 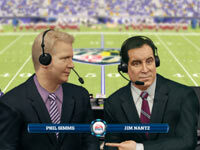 CBS’ Phil Simms & Jim Nantz. So long Madden. We’ve had a heck of a run. I’ve been as loyal of a Madden fan as any. I’ve purchased the game every year since the early 90’s on Sega Genesis. And I’ve always enjoyed playing the games themselves, but it was the introduction of the franchise mode (1998?) that got me truly hooked. Every year, as more and more features were added to the franchise mode, I found the game to be more and more addicting. Nothing could add to the games replay value more than a detailed franchise mode where I felt like a real GM, developing my team and molding them into a perennial contender by taking over every detail of the organization and calling all the shots.I believe Madden hit its peak during the final year on the PS2/XBOX console when every detail of your franchise could be controlled, right down to the price of refreshments in your team’s stadium. Admittedly, the game has been a bit of a disappointment since its transition to the latest generation of consoles (PS3 & XBOX 360). The franchise mode was essentially stripped down to the very basics…just a shell of its old form. I understood, at least for a year or two, that the game would have to make a few sacrifices in order to get the game fully functional for the new consoles. The graphics had vastly improved, and I felt I could deal with a lighter version of the franchise mode if it meant playing such a good looking football game. But EA has done very little to bring its franchise mode anywhere close to its old form. There was a glimmer of hope for us franchise enthusiasts in Madden ’12 when the game made a number of improvements, publicly acknowledging that Madden had put its franchise loyalists on hold for too long, and the feature was in some great need of improvement. Then Madden ’13 was released…Madden 13 is a slap in the face to any fan of the franchise mode that has stayed true despite the repeated disappointments over the past 5 years. The franchise mode has been completely removed from the game. EA will tell you that the “Connected Careers” (CCM) mode serves as the game’s franchise mode now. I beg to differ. The CCM is a sad, sad attempt to contemplate those of us who enjoy the franchise aspect of the game. Anyone with a little awareness can see that EA’s attempt to make everything “XP” based is a move to eventually monetize every aspect of the game… (Example: your players no longer progress based on their performance throughout the season. They earn “XP” for reaching certain goals which can be used to purchase upgrades to their attributes.) Everything is about earning “XP”. You can’t even scout future prospects unless, you guessed it, you’ve accumulated some precious “XP”. This ‘subtle’ addition may be the scariest aspect of the latest edition of Madden.To those of you who have been told that CCM replaces franchise mode in the game, here is just a short list of features that are completely gone:- Offline franchise mode multi-player (seriously?? I’ve played a league with my best friend every year since 2001. )- Fantasy draft (that’s right, if you like drafting a team to control from scratch….forget about it. )- Option to upload NCAA 13 rosters for your drafts (the only reason I buy NCAA…)- Ability to edit player appearance/ratings- Ability to create a team/logo- Ability to move your team to another cityI won’t even list all of the features that still exist but have had their functionality severely reduced. (Example: you can still trade and sign free agents but the trade logic has been tweaked such that unless you’re trading a superstar for a draft pick or two, it’s not going to happen. Free agents can be signed but the length and size of the contract can’t be adjusted) This would end up being a review too long for anyone to read if I included all the reasons why the features that remain are lacking.According to EA, the series has approximately 5-7 million dedicated fans, and they’ll likely sell over 3 million copies of the game by October. Apparently they’ve decided that the franchise fans make up too small a minority to worry about. A calculated risk I assume. I’ll be returning my copy though, and they can exclude me from their list of dedicated fans going forward. FRANCHISE MODE DRASTICALLY CHANGED Okay, so if you play this game by yourself online, and that’s ALL you do, then you might not agree with this review……however, if you are like me, I primarily play offline franchise mode, so drastically changing this feature is a risky gamble for EA when it comes to gamers like myself. The only two words that I can use to describe ‘franchise mode’ this year is: EPIC FAIL. Madden 13 has something called connected careers, which serves as its only vehicle to play what past Madden’s have called ‘franchise mode’. This works well for online play, but if you are like me, I like to play franchise mode offline with a friend (you know, in the same room). We create our own guys, do a fantasy draft, and play as many seasons as we can until the next Madden comes out.Not this year. EA has chosen to abandon this group of gamers. Most of the features for offline franchise play have been removed. Create a player, and have him play in your franchise? Nope. Fantasy draft? Gone. You are stuck playing with the current roster of whatever team you chose. ANY roster customization? Virtually all roster customization is gone. Again, you are stuck with the real-life team rosters. You can’t even edit player attributes, names, or positions.Finally, and this was the deal breaker for myself, and I will be returning the game I have bought every year for the last 10 years if there isn’t an update issued. Multiplayer offline franchise. That HAS to be included, right? RIGHT? Unbelievably, no. I have no idea why they would take this out. It seems like a no-brainer, and quite frankly, I am a little pissed about it. Being able to have friends over and play Madden on franchise mode can’t even be done in this years Madden. This literally makes this years Madden worthless to myself.If EA included last years offline franchise mode with Madden 13, and nothing else in Madden 13 changed, my review could very well be 5 stars, so don’t infer that my 1 star rating is for everyone. It’s not. But, I know a lot of people who play offline franchise, and wanted to warn everyone else in this group that EA decided to ignore us this year.UPDATE: 10/28/2012I patiently held onto my copy of Madden 13 for a while to see if any updates by EA would be issued to correct some of the complaints I had above. I am happy to say that EA issued an update in mid-October which added some of the left out features. The update included the following:1. Multiplayer offline franchise mode (up to 6 players)2. Ability to import and edit rosters into offline franchise mode, this includes being able to bringing in created players, so it is now possible to play as yourself3. A handful of tweaks to gameplayAs far as I can tell offline fantasy draft was not included. I personally love the ability to perform a fantasy draft, however, adding multiplayer and roster editing is still HUGE. Overall, I increased my rating by 1 star, so it is now 2 stars overall. The gameplay compared to Madden 12 is improved, and I think the overall experience is quite a bit of fun, so if you like previous Madden games, you will be happy with the purchase. If all of the features would have been included in the original release date (including the still left out offline fantasy draft), I think this version could have been worth a 4 star rating. So call it sour grapes, but having to wait nearly 2 months for the features that I consider a staple of Madden, I can’t bring myself to give it over 2 stars.